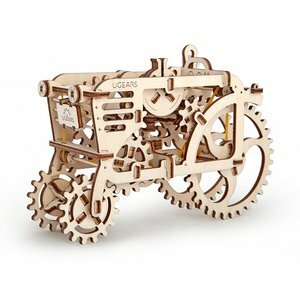 UGEARS Tractor is a mechanical 3D puzzle, a self-assembly model with no glue or any special tools (the parts are ready-made and can be simply removed from the board). To be assembled according to the manual. It can pass around 80 cm at a leisurely pace. In this case the “engine” works rhythmically and the pistons move. In the “park” mode the tractor can be started by spinning the big wheel. In the “drive” mode the tractor will move at a leisurely pace with a speed of approximately 5 cm per second. If the “sport” is selected, the tractor will speed forward. If you hold the board with its front side directed to you, it is better to remove the parts by pulling them. In this case, if a burr is pulled together with a part, it will make a pit in the board, not in the part. The best solution is to incise the hangers with a knife. If you have difficulties in inserting a toothpick in the assembled gearwheel, rub the toothpick with a candle. You may also lubricate all the projecting axes of the gearwheels before installing them on the frame. In this case the friction during rotation will be minimal. Note: do not lubricate the parts of pendulum connection with a candle – two projecting sticks in the tractor or timer. In this case the pendulum will not swing but skid. Try to remove big burrs on the gearwheels, if any. The motion of some models is very delicate, and they may hinder it. If any gearwheel creaks or squeaks, lubricate it with a regular candle: paraffin or wax. If the plywood edge is too resinous and some teeth tend to seize, which happens quite rarely, lubricate the gearwheel in the same manner. Warning: the construction set contains tiny details. Does not contain hazardous substance. Keep dry.